Order your Quiver Extra Large B5 2 Slot Pen Holder today from FahrneysPens.com. Fine Pens, Refills & Luxurious Gifts – great prices & fast shipping. 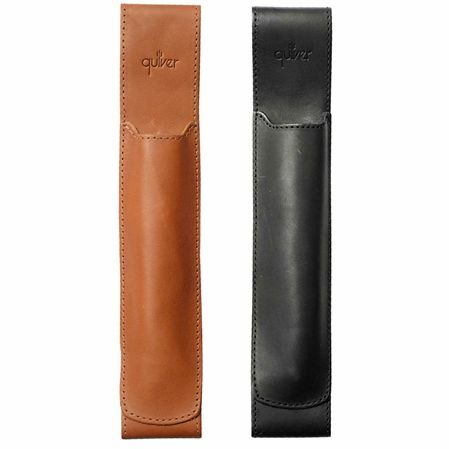 Fits onto covers 9.25" to 10.5"
One of the most popular accessories, the Quiver leather pen holder is the solution to a common writer’s problem – losing a favorite pen or stylus. 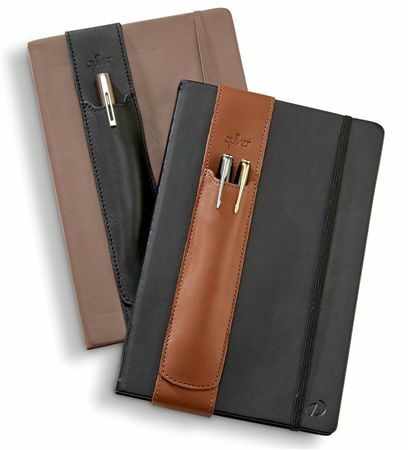 The Quiver is backed with an elastic band to slip seamlessly onto the cover of your favorite notebook, journal, iPad or tablet case, securely holding up to two writing instruments. Handcrafted in full-grain leather with a supple finish, the Quiver is stitched with industrial marine-grade thread and built to last. The extra-large Quiver B5 fits hardcover notebooks 9.25 to 10.5” tall, and Apple iPad and Air cases, Surface Pro and other cases of similar dimensions. Never lose your pen again! Fits onto covers 5.4” to 6” tall.